SAMPLE MEAN CHANGE 0. 0. 0. 1. 1. 1. 0. 0. -1. -1. -2. -2. SST POTENTIAL -1. -1. -1. 0. 6. 15. 25. 33. 38. 41. 44. 47. VERTICAL SHEAR MAG 1. 2. 2. 3. 4. 5. 5. 5. 5. 5. 4. 4. VERTICAL SHEAR ADJ 0. 0. 1. 1. 1. 2. 1. 1. 1. 1. 1. 0. VERTICAL SHEAR DIR 0. 0. 0. 1. 1. 1. 0. 0. 0. -1. -1. -2. PERSISTENCE 0. 0. 0. -1. -1. -1. -1. -1. -1. -1. 0. 0. 200/250 MB TEMP. 0. -1. -2. -3. -6. -9. -12. -14. -16. -17. -18. -18. THETA_E EXCESS 0. -1. -1. -1. -2. -3. -3. -4. -4. -5. -5. -5. 700-500 MB RH 0. 1. 1. 2. 3. 4. 5. 6. 7. 7. 8. 8. MODEL VTX TENDENCY 0. 1. 2. 2. 4. 7. 9. 11. 13. 7. 0. -5. 850 MB ENV VORTICITY 0. 0. 0. 0. 1. 1. 2. 2. 3. 4. 5. 6. 200 MB DIVERGENCE 1. 1. 2. 3. 4. 4. 3. 3. 2. 0. -2. -5. ZONAL STORM MOTION 0. 0. 0. 0. 0. 0. -1. -1. -1. -1. -1. -1. GOES PREDICTORS 1. 2. 2. 2. 2. 1. 0. -1. -3. -3. -4. -3. OCEAN HEAT CONTENT 0. 1. 1. 2. 2. 3. 3. 2. 3. 3. 3. 1. TOTAL CHANGE 2. 4. 8. 11. 20. 29. 35. 41. 44. 38. 30. 25. Now a Complex Situation in the Atlantic/BOC got even more complex. 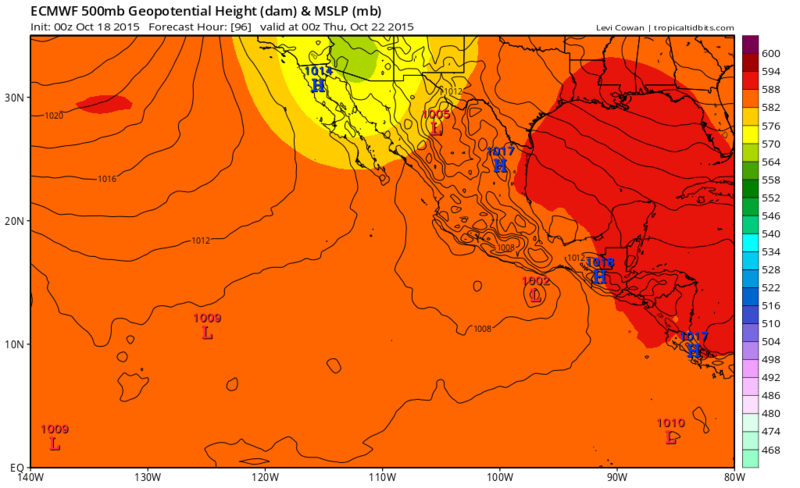 Not at all complicated, is very simple, 97E has the best UL environment along with very warm waters to work with. 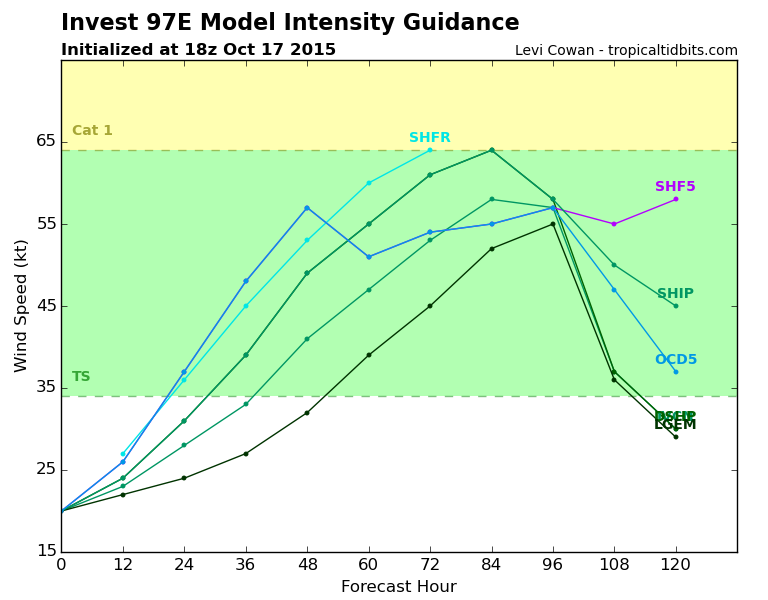 97E develops further would mean 92L chances of development over the BOC will be very low. Weatherwatcher98 wrote: Now a Complex Situation in the Atlantic/BOC got even more complex. How is it more complex? 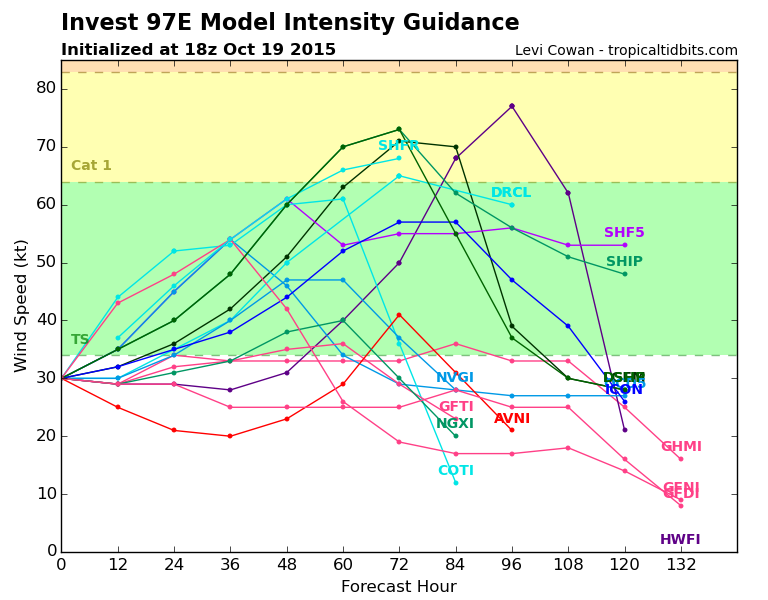 So the models were showing 97e all along? 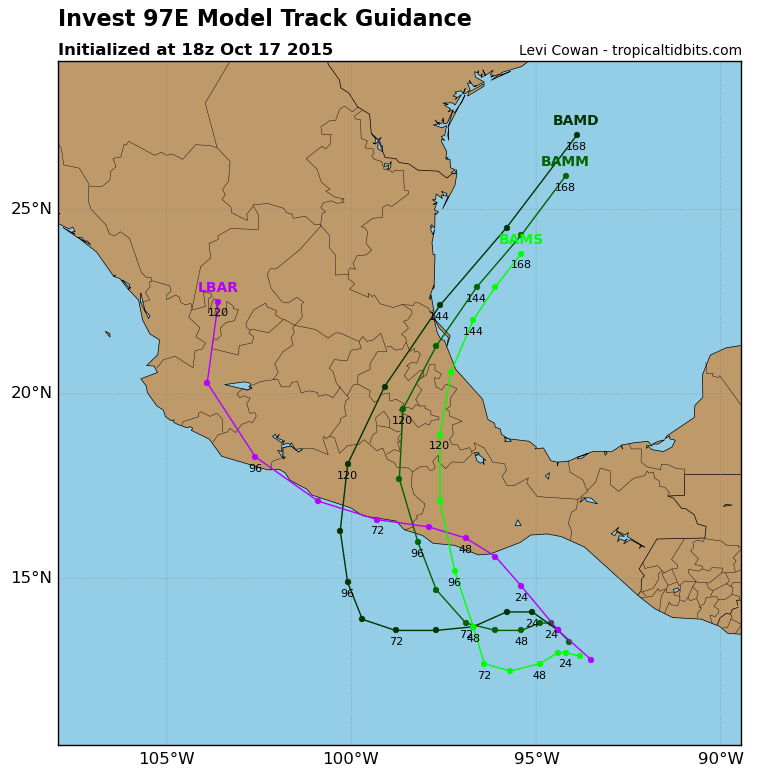 Why did the NHC highlight 92L moving into the bay of Campeche? I am beginning to think nothing will form in the BOC or survive a crossover. southeastern Mexico during the next several days. 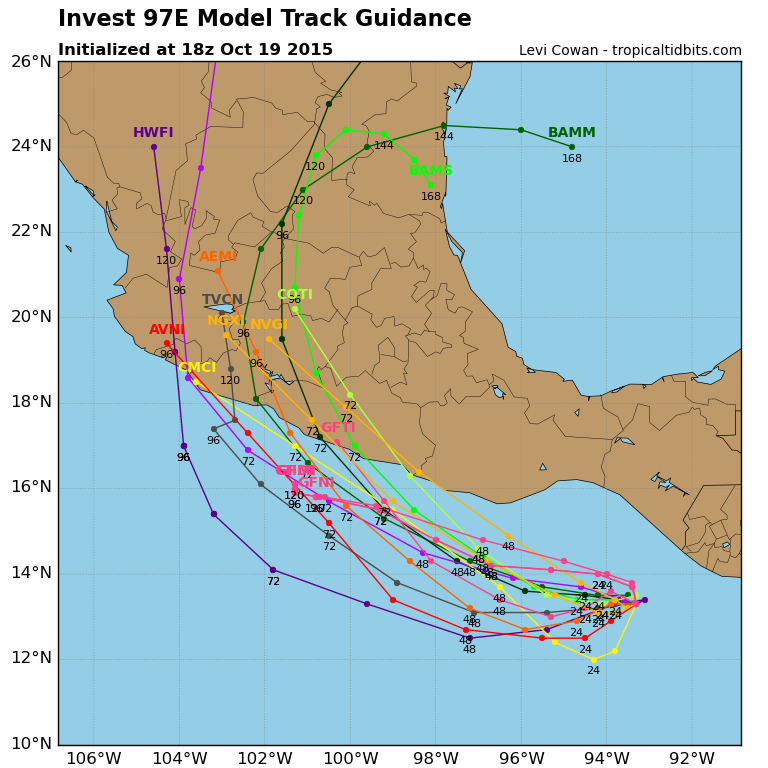 Weatherwatcher98 wrote: So the models were showing 97e all along? 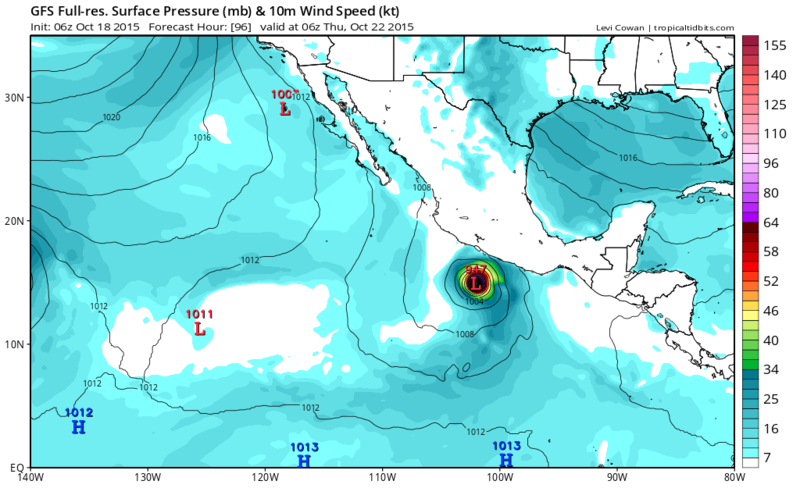 Why did the NHC highlight 92L moving into the bay of Campeche? I am beginning to think nothing will form in the BOC or survive a crossover. It's possible both areas may form. 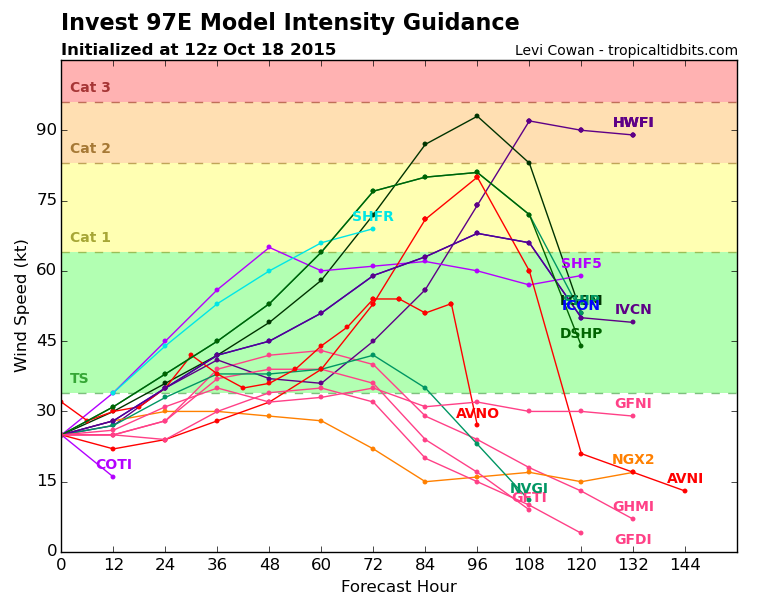 It's also possible the NHC was expecting 97e to form, but also gave 92L a shot. The NHC has had this tagged, long before this was invest'd. and southeastern Mexico during the next several days. VERTICAL SHEAR MAG 1. 2. 3. 4. 6. 7. 9. 9. 10. 10. 10. 9. VERTICAL SHEAR ADJ 0. 0. 0. 0. 0. 0. 0. 1. 1. 1. 1. 2. VERTICAL SHEAR DIR 0. 1. 2. 2. 2. 2. -1. 0. -1. -2. -3. -4. 200/250 MB TEMP. 0. -1. -2. -3. -6. -9. -11. -14. -16. -17. -17. -17. THETA_E EXCESS 0. -1. -1. -1. -2. -2. -3. -4. -4. -5. -5. -5. 700-500 MB RH 0. 1. 1. 1. 2. 3. 4. 5. 6. 6. 7. 7. MODEL VTX TENDENCY 0. 0. 0. 1. 1. 2. 2. 4. 7. 5. 0. 0. 850 MB ENV VORTICITY 0. 0. 0. 0. 1. 1. 1. 2. 3. 3. 4. 5. 200 MB DIVERGENCE 1. 1. 2. 2. 3. 3. 2. 2. 1. 0. -2. -4. STEERING LEVEL PRES 0. 0. 0. 0. 0. 1. 1. 2. 2. 2. 2. 2. GOES PREDICTORS 1. 1. 2. 2. 2. 0. -1. -2. -3. -4. -4. -4. OCEAN HEAT CONTENT 0. 1. 1. 2. 3. 3. 3. 3. 3. 3. 3. 2. TOTAL CHANGE 1. 3. 6. 9. 15. 22. 26. 34. 39. 37. 33. 33. This may be a strong one and to make landfall. Lots of rising motion coming near 100W. 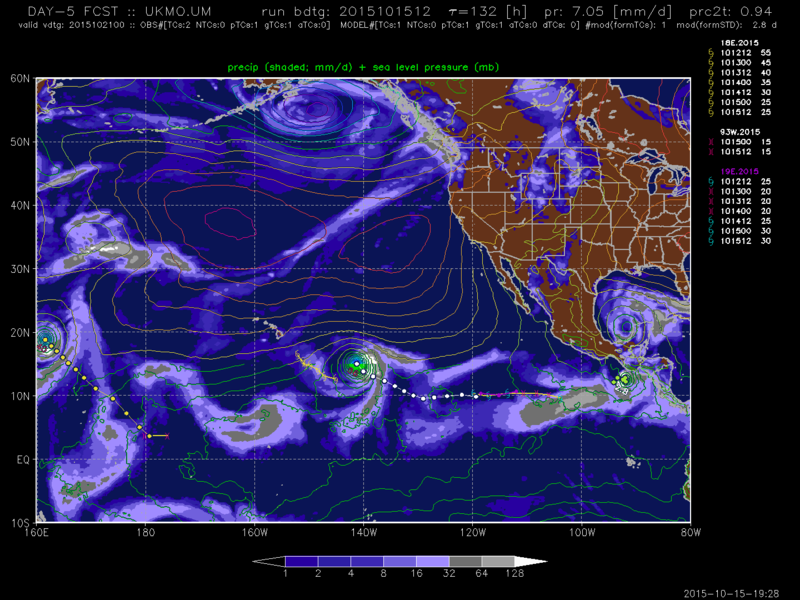 Most of the EPAC for that matter. This one is looking almost guaranteed to be far more destructive than 92L, unless 92 dumps a tonn of rain on S TX and the eastern Mexican coast. El Salvador during the next couple of days. monitor the progress of this disturbance during the next few days. Looks like this could be a fairly strong system at landfall. or northwestward offshore of the coast of southeastern Mexico. should monitor the progress of this system during the next few days.